EU's foreign policy chief believes the gap with Iran in nuclear talks can be narrowed in talks next week. Iran is far apart from the six world powers negotiating with it over scaling back its nuclear program, but that gap could be narrowed in talks next week, the European Union's foreign policy chief said on Monday, according to Reuters. Iran and the powers failed to meet a July 20 target date for an agreement and are due to hold their first negotiating round since then in New York on September 18. The deadline for a deal has been extended to November 24. "My hope is that we will make progress. 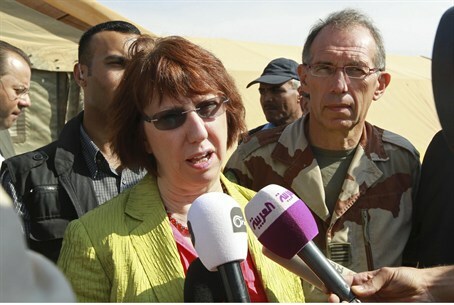 ... We believe although we are far apart, there is the possibility of being able to narrow the gap," Catherine Ashton told reporters in Ottawa when asked about her expectations for the New York round. "But we are determined in so doing to do it fully aware that the world is watching and expecting that any agreement must be a good and positive one if it can be found," she added, according to Reuters. Ashton was in Canada's capital, Ottawa, for a meeting with Foreign Minister John Baird. The six powers - the United States, Russia, China, France, Germany and Britain - want Iran to scale back its nuclear program in exchange for phasing out tough sanctions. Western countries suspect Tehran wants to be able to build a nuclear bomb. Iran says it is a peaceful project to generate electricity. Iran has been taking an increasingly aggressive line in demanding its "right" to enrich uranium, with Iranian Supreme Leader Ayatollah Ali Khamenei recently saying Iran "needs" 19 times more nuclear centrifuges than the amount being offered by world powers. Israel’s Minister of Intelligence, Yuval Steinitz, warned last week that Iran “is closer than ever to nuclear capabilities”. "What we see today is a very troubling picture. While Iran has agreed to several small concession, on all the issues touching the heart of the (nuclear) program, like uranium enrichment in the centrifuges, Iran hasn't agreed to budge even a millimeter," said Steinitz, who will head an Israeli delegation to Washington DC next week to petition U.S. officials to take stronger stance in renewed talks between major world powers and Iran. "We oppose not only the possibility that Iran will be a nuclear-armed military state, but also to the very possibility that Iran will be a nuclear-threshold state," continued Steinitz.